I finally figured out how to retrieve the photos my husband took at the premier with his iphone. They aren’t the best quality. However, I am glad to have them! My best friend (you look good girl! 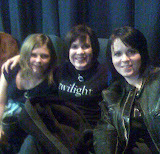 ), her husband, my oldest daughter, my husband and I went to see the movie together. The theater we were in held 400 people! It was a sold out showing. decided to buy a copy themselves. In return, we have enjoyed many conversations texting and talking on the phone about Bella & Edward. The one aspect I have cherished the most is the chance for my daughter and I to share our thoughts and feelings about the book. It has given us a chance to discuss topics that we may not have otherwise. It was fun to sit beside her and hear her comments. Honestly, I probably talked more than she did! We went again to see the movie Thursday (her second time, my third ). This time I took her and my son. I think my son was feeling a little left out and wanted to see what his mom has been obsessing about so much. After the movie I said to him, “So, what did you think?” “It was pretty good!” he exclaimed. I just finished reading this adorable and hilarious book to my youngest. 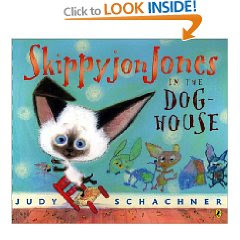 We bought a 3 pack of the Skippyjon Jones books from Scholastic. They are my favorite books to read to her. Even my 10 year old boy likes to hear me read them. They are about a Siamese cat who thinks he is a Chihuahua. I totally recommend these books for kids! It is just as fun for me to read them as it is for her to listen. I love to hear her giggle as I use my rusty Spanish accent. They really are very funny! The illustrations are just as wonderful as the text… 4 stars from me! Where do I start…hmmmm. This book is brilliant. Stephenie Meyer is brilliant. If you love science fiction, you will adore this book. I have to admit, I was hoping for a little bit more romance. I am learning that I enjoy the “ooey gooey” love stuff in books. Once I got past that, I was hooked and loved the suspense. I don’t know how she or anyone who writes science fiction comes up with… with this whole new world!? The beginning had my mind reeling with curiosity. It was not as slow a start as I thought it might be. I finished the book last night. The end of the book has so many great quotes in it and I can see so much of her faith revealed. Maybe not everyone reading would see this. As usual it all depends on who you are, what you think about and your perspective. There are many parallels to what our current world is like right now. “From human times…”Man Burns Three-Year-Old Daughter to Death,” the headline screamed at me, accompanied by a picture of an angelic blond child. This wasn’t the front page. The horror detailed here was not so hideous as to rate priority coverage. Beneath this was the face of a man wanted for the murders of his wife and two children two years before the print date; the story was about a possible sighting of the man in Mexico. For this reason, I could see why the thought of GOOD aliens coming here to make our world a better place could be a remedy. Hope this day brings you great happiness, even in troubled times.